In recent weeks, my journey into vintage perfumes has ignited much interest in chypres. Francois Coty's influential perfume Chypre de Coty of 1917 was the first to coin the name and, in fact, define the entire olfactory family. The classification encompasses scents that traditionally consisted of a number of base accords - chiefly oakmoss and ambergris; along with other notes such as civet, patchouli, labdanum, and rose. The resulting blends are often described as dark, full-bodied and aromatic... liquid shadows, perhaps. In the 21st century they are immediately recognisable when opening heavy vintage art-deco flacons tied with gold thread... ones that are uncovered in dark bathroom cupboards, or in dusty dresser drawers lined with faded paper. Often, any antique perfume sampled that is characterised as "old-fashioned" or "heavy" is likely to be a chypre, as the 1920's and beyond saw many new chypres enter the market. As a result, chypres fell from favour a little during the 90's when stark androgyny and 'shared scents' were the norm as far as perfumery was concerned. Fortunately though, new sensibilities particularly in the niche perfume market, have resulted in a resurrection of chypre-style scents in the 00's. Only yesterday I was sent one such fragrance by Swiss perfumer extraordinaire Andy Tauer named Une Rose Chyprée - the first of a series of Tauer Perfumes Mémorables that he intends to release. Une Rose Chyprée opens with sparkling mandarin that prickles one's saliva glands, mixed masterfully with a bright, enduring floral note of clementine. It is a radiant opening that triggers the senses with energising lemon and bergamot, and minty, citrusy bourbon geranium. This sprightly, invigorating top soon reveals a wonderful depth and resinous darkness beneath. 10 - 15 minutes after application the resplendent headnotes give way to a transient dusky, ambery powderyness that one instantly associates with traditional perfumes from bygone eras. A vermillion-coloured thread of rosa damascena emerges, and I am suddenly cast back to the 1920's, to an age where women wore furs, felt hats and powdered faces. This is a scent Louise Brooks might have worn in one of her many silent films as the quintessential flapper. It is brimming with a ritzy, lavish sense of youth and beauty, but also a melancholic feeling of being sadly lost to time. As Une Rose Chyprée evolves on the skin, warm earthy hues shift forward and provide the classic chypre foundation of the perfume. Labdanum lends a balsamic floral prettiness to a rich patchouli and aromatic oakmoss base. A measured swathe of vanilla furnishes a semi-transparent sweetness that plays against a hot cinnamon and spicy Bay accord at the heart. So sincere is the perfume's inherent sense of 'yesteryear', one might easily be fooled into thinking they are indeed wearing an opulent elixir fashioned at the beginning of the last century. The beauty however, lies in the very fact this an eau de parfum is very wearable today. Tauer has done an extraordinary job here capturing a whimsical moment lost to the ages. He has breathed new life into the chypre family by re-interpreting the classics and by using contemporary methods to do so. Une Rose Chyprée is a master stroke accomplishment, and quite possibly represents some of his best work yet. 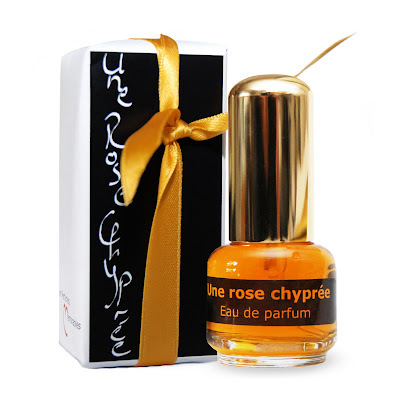 Une Rose Chyprée is offered in hand bottled and hand packaged 15ml flacons and will be launched internationally on July 1st, 2009. For two lucky readers however, Sorcery of Scent is giving away two carded samples of this perfume prior to its release. Simply leave a comment after this post, and ensure you include a contact email address. Two winners will be picked at random, and notified on Monday May 18th. Nice post about chypres Dimi! Thanks for the review Dimi. I definitely need to try this one! Sounds like a magnificent rose chyphre. I definitely need to test drive this one. Please enter me in the draw. Excelent post Dimitri. Un Rose Chyprée sounds amazing! Please sign me up for the drawing. Thanks! I would do just about anything to smell (and better yet, to look) like Louise Brooks! This sounds right up my alley, Dimitri. Very nice write up. thanks for your blog! Please enter me into the draw. ~Thanks! Wow, I can't wait to try this! How's the rose? Prominent? Or more like a supporting note with all of the other chypre elements? Well, I hadn't been able to make up my mind as to whether I wanted to acquire sample of this one. I love chypres, and I love rose, but I'd read such mixed reviews. Now, I gotta try it! Thank you for a review that is evocative, comprehensive, and a really good read. Also, I love the previous mother's day post. Your mother must have been very touched. Hi Dimi ! ... Excellent post on Tauers latest juice. I do luv my Chypres. (As you will soon see, when you receive my latest little package ;o) ...) I have so been looking forward to it. As I'm pretty sure that I will not be disappointed. I would luv it if you can please "throw my name into the hat", for a sample. Thanks so much for the offer. How exciting. And how nice of you to do this. Most exciting, is discovering your blog. Thanks for pointing this out. It is I Brielle from BN. You have blown me away with your description and have me wanting this scent; knowing I am the queen of vintage fragrances, that says a lot about how you described this scent. I am so pleased you are become fond of vintage scents, it is a passion that turns into mania. "Je suis folle du parfum." Enjoy the journey into the "dark side"
Count me in as hopeful to try a sample of this! Oh, how exciting! Thank you. I have an insatiable apetite to try out rose fragrances...come on bring it on! Profundity and beauty in the modern age - it's a miracle! I can't wait for July so I would love to have a sample now. Thank you for the profound and beautiful review. I am fascinated by the perception that the old beauty does need some transformative touch to enable it to live with us today and apparently Andy Tauer has accomplished this. What a wonderful post! I don't think I've ever anticipated a perfume release as fervently as I'm anticipating Un Rose Chypree. Please enter me in the drawing. My fragrance journey started as a quest for a masculine chypre. All you needed to say was chypre, rose and Tauer in the same sentence and I was hooked! Congratulations on being named a finalist for Best Blog in the 9th Annual Basenotes Awards. I hope you win! Although old fashioned chypres aren't my cup of tea, usually, your review of this new one makes it seem like it could change my mind. Please sign me up for the drawing. I love chypres, rose scents, and Andy Tauer's work. I can't wait to smell this one. Please enter me in the draw! Andy Tauer and Louise Brooks... what a pair! I can't wait to smell this! I would love to try this! Incense Rose my favorite but I'm looking to branch out. Rose Chyree seems like a great place to begin. Thank you for your review! I am a new reader and fairly new to perfume, and I've been looking forward to trying this one. Please enter me in the draw. Oh wow, Une Rose Chyprée sounds like a divine scent from how you've described it! I haven't been able to sample any Chypree's yet as i'm just starting out in my fragrance journey, but i've been meaning to try some soon. And i LOVE Andy Tauer's works that i've been able to get my hands on (Vetiver Dance and Incense Extreme). So this would have the added bonus of being created by a perfumer that i hold in esteem. Can't get much better than that. If i happen to get chosen, my email is tonto13216@hotmail.com . But even if i don't win, i think i'm going to have to order some of this fragrance once it comes out. Also, thanks for doing such a great job on your blog, Dimitri! I've loved reading the in-depth reviews of the fragrances i've read about so far, so please keep it up! Thank you for this article. I love the Tauers I've tried so far and hope to try this as well. Sounds wonderful....love Andy's scents and look forward to this one. Hey nice review and blog, it seems like a very deep and profounded overview. I would love to win a sample!